Kimmel Carter Managing Partner Larry Kimmel, President William Peltz, and Partner Jon O’Neill are pleased to announce that Associate Heather Long has been appointed as the firm’s newest partner. 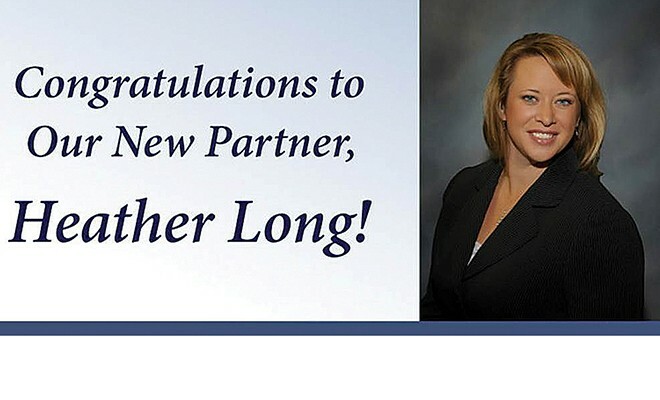 “I know I speak for Bill and Jon in saying that we are all very proud and excited to have Heather join us as a partner, following her many years as a valued associate with the firm,” says Larry Kimmel. An experienced trial lawyer and negotiator, Heather joined Kimmel Carter as an associate in 2009. Along with Partner Ed Carter, she has a background in personal injury defense, an experience that has helped her to provide superior service to her clients. As a Kimmel Carter associate, Heather maintained a strong record of success advocating for both car accident victims and other personal injury victims, as well as for injured workers. In addition to noting her skill as an attorney, Heather’s past clients consistently comment on her calmness under pressure, her professionalism, and her compassionate handling of cases. In her new role, Heather will be among a relatively small, though slowly growing group of women who hold leadership positions at American law firms. According to the American Bar Association, women currently comprise less than 22 percent of all law firm partner roles in the U.S. While Heather is proud to join that group, she is most eager, she says, to simply find new ways to serve her clients as a Kimmel Carter partner. Heather graduated from the University of Nebraska-Lincoln and received her J.D. from Widener University School of Law. She is an experienced advocate for personal injury plaintiffs and workers’ compensation claimants with a background in personal injury defense, and she has expertise in creative settlements, alternate dispute resolution and mediation. Heather has coached the Salesianum High School Mock Trial team and has served as a bar exam preparation mentor for the Multicultural Judges and Lawyers Association. For the past few years, she has written a quarterly column for the New Castle Country Women’s Journal focused on various workers’ compensation issues, particularly in how they pertain to working women. Heather is barred in Delaware, New Jersey, Pennsylvania, the U.S. Virgin Islands, and the U.S. District Courts in Delaware and New Jersey. ← Previous Story What Happens When the Caregiver Becomes the Patient?